PLAGUE, by Grey Gnome Games, is a low-fantasy themed trick-taking card game set in the dark ages of Europe where three major kingdoms are in a great war and death is all about. Sword and shield might rule the battlefield, but the Plague can reduce the mightiest army to dust and decay. Walking the war-torn land are clerics who have the knowledge to heal the sick and bring comfort in a land that knows nothing but wickedness and despair. The game plays fast, has a unique scoring mechanism, and uses simple rules. Combat is played out behind the player’s hand as they strategize and scheme. In the end, only one kingdom will rise from the ashes. PLAGUE is comprised of 36 cards. In this deck are 30 Army cards (10 of each color: red, blue, and green), 5 Plague cards, and 1 Cleric card. The artwork is superb and is spot on with the theme which only further strengthens the narrative of the game. To set up the game, take the deck and shuffle it thoroughly. If playing with 2 players, discard the top 6 cards and remove them from the game. Deal out the rest of the cards to the players. The players can look at their cards but should keep their deck hidden at all times. Any discarded cards for a 2-player game should also remain face-down and hidden from all the players at all times. Not included in the game, but necessary to play, is a piece of paper and a pen or pencil to write with to record scores. Pick the first player and begin. Every card in the game has to values. The firs is the Card Value (CV) that is used to determine the strength of the individual card and also represents the cards color. Both values are important when determining who wins a single hand in the game. The second is the Victory Points (VP) that is used at the end of the a round to determine a player’s score. Not immediately apparent until you look at all the cards is that the VP value of a card is lower for cards who have a high CV number, and vice versa. This means that the most powerful card in an army (a 10), will only score 1 VP, but the Fool will score 10 VP with a CV of 1. The Cleric card has the highest CV of 11 and has a value of zero VP. The Plague cards are the only exception to this rule. The Plague card’s CV and VP values are opposite of each other. For example, the Plague cards with an 8 CV has a VP value of -8. PLAGUE is very similar to another card game, Spades, where the first card played sets the card suit (Army or Plague card) and the current value to beat. 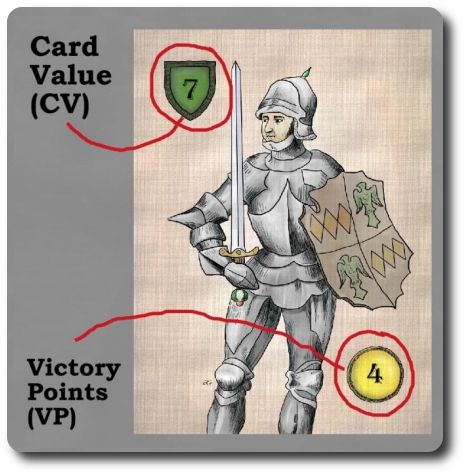 Players must play cards that match the suit (matching the Army color or a Plague card) of the first card played if possible. For example, if a red Army card is played, all players must play a red Army card if they have it in their hand. When two or more cards of the same Army are put together, the card with the highest CV always wins. But PLAGUE adds an additional twist. To being with, not every Army card is created equal. An army of one color can always beat an Army of another color. In this way, the Army cards can be used to trump (the winning card) all other Army cards of a specific color regardless of their value, but only if the player does not have a card of the same suit that led. Any red Army card will beat a green Army card, any green Army card will beat a blue Army card, and any blue Army card will beat a red Army card. 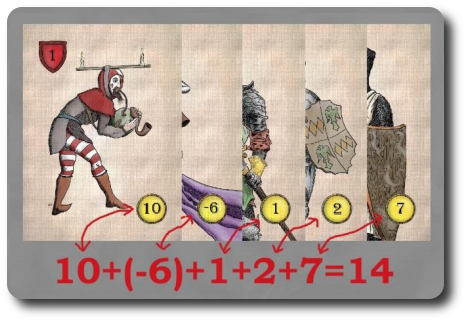 The Plague cards can only be played if the player chooses to lead the hand with it or if it is played when the player does not have the suit of the lead card. If played as the lead card, all players must play their Plague cards if they have any. 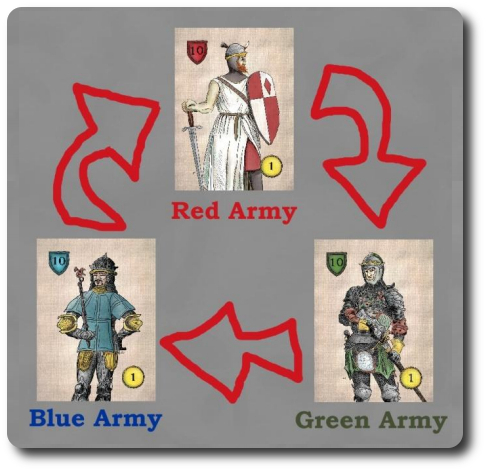 If a player does not have any Plague cards, the first Army card they play becomes the lead suit which all player who have not taken their turn yet must follow if possible. The Cleric is a very special card. Only one is present in the deck and might not always be available during the round for a 2-player game. The Cleric can only be played if a Plague card has been played before it. Regardless of the Plague or Army CV, the Cleric always wins the hand. Always. When a player wins the hand, they take the card that won the hand (the “trick”) and place it face-up and in front of them with the other cards in that hand placed face-down under the trick. For example, if a Plague card won the hand, it would be placed face-up on the stack of face-down cards that were part of that hand. The only exception is the Cleric card that can be used to replace any ill won Plague cards. This is done by placing the Cleric card face-up and all other cards, including the Plague card and the cards underneath it, face-down. The Cleric card is placed on top of this stack of cards. While the Cleric does not provide any VP value, it nullifies the negative VP value given by the Plague card. Once all the cards in the round have been played, the players now calculate their score. This is done by taking the top face-up cards the player has won, ignoring all the other cards underneath it, and adding the VP values together. The scores are recorded on a piece of paper for all the players and a special mark should be made next to the winning player or players with the highest score. Note that it is possible for a player to have negative points and even zero points for the round. The game now continues. Collect all the cards, shuffle, and repeat the game set up. The game continues until one player or players wins 3 rounds. The rounds won need not be sequential. For example, a player could win the first two rounds, lose the next two, and then win the game by winning the fifth round (for a total of 3 rounds won). If there is a tie, tally the points of those players who tied. The player with the highest points wins. To learn more about PLAGUE, see the game’s main web site. 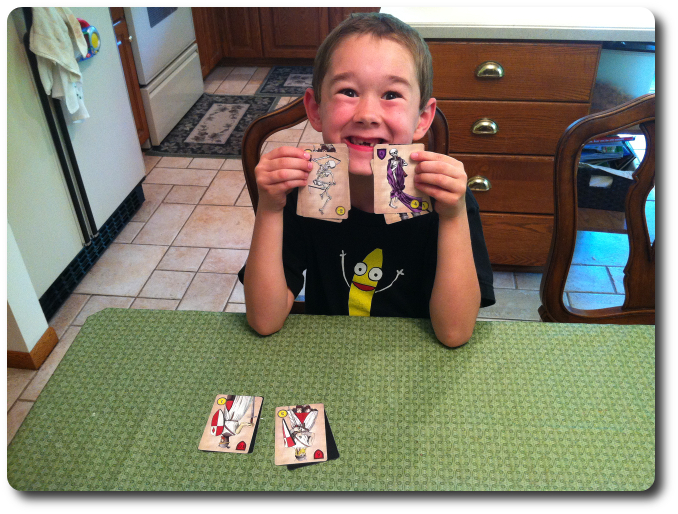 My little geeks have played trick-taking card games before with mixed results. Honestly, I think their level of enjoyment is based more on the alignment of the Moon and stars at times. For example, I played Hearts with my oldest on one occasion and he loved it. A few weeks later, he despised every second of it. A good deal of my game testing with my little geeks is based on timing. If I put a game in front of them at the wrong time, it will cause the entire game to flop. This is why I play the games a few times with my little geeks to ensure that I have the accurate portrayal of their level of endorsement before I write the review. For adults, this is by and large unnecessary. Adults can usually communicate to me their thoughts and opinions on the game based off one of play, accurately portraying their level of endorsement. As such, I had to wait for the right opportunity to play PLAGUE with my son. Lucky for me, the game set up time and game rules are short. All I needed was a 1/2 hour of time where my son was open to new ideas, ready to be challenged, and be objective. Some days, finding opportunities like this is like trying to find Waldo in a sea of a billion faces. Other days, he comes to me asking for a game. It is on these days I usually do most of my testing. When that day arrived, I presented my little geek with the game and how it was played. He was willing to give it a shot and rather liked the them of the game. Unlike Spades, which has no theme, PLAGUE can tell a story as it is played out which is a good deal more engaging. After I explained the rules, I had my little geek shuffle the cards and deal them out. As he did so, I asked him his thoughts on the game so far. The “skeleton cards” he is referring to are the Plague cards, and he is correct about the Rock-Paper-Scissors like trumping the Army cards use when determining tricks. Let’s play the game and see if it keeps his interest or becomes a casualty of boredom and disinterest. The Parent Geeks were not sure what to make of the game at first. They thought, based off of my description, the game would be gory, violent, and rather graphic in nature. Of course, the game is nothing of the kind. It does have a dark thematic background and narrative, but that never comes into play. When they sat down and played it, they loved it. They especially liked how the points were scored and the additional level of thought that was necessary before placing a card. Gamer Geeks forced their way through it, but not overly so. They recognized it as a trick-taking card game and brought to the table their own assumptions based on this fact. It surprised them that the game was much less boring then they originally assumed. They also liked how the scores were taken in the game, but found the lack of theme (other than the card artwork – which is absolutely awesome) made PLAGUE nothing more than just a plan old card game. This meant they had little interest. They never suggested it was a bad game, however; just not a game they wanted to play again anytime soon. Gamer Geeks, while all who played it agreed it had an interesting scoring rule, the game itself did little to keep the interest of the gamer elitists. The game was too basic and provide little in the way of complex strategy or tactics, from the elitist’s point-of-view (I tend to disagree, however). All Gamer Geeks agreed (including me) that they would not turn down a game if offered because of how fast it could be set up and played. While not a glowing endorsement from this test group, it does suggest that the game is entertaining enough to those who usually seek out more complex experiences. Parent Geeks, despite the rather dark theme in the game, there is nothing in the actual game play itself that suggests violence or death. The blood and gore, disease and decay are only suggested at in the game’s narrative through the game rules. Remove that and there is nothing to suggest to a little geek that violence is occurring at the table. This proved to be the saving grace for the Parent Geek group as they all approached the game with much hesitation when I described its back story. Once they played the game and saw for themselves that the back story played no part in the game play, they visibly relaxed and very much enjoyed the game. The easy rules and quick game play did not detract from the level of competition the Parent Geeks brought to the table. Even the non-gamers had a good time, but they were slightly slower to pick up on the game’s twists and turns. Child Geeks, oddly enough, really enjoyed this game. My son, in particular, was having a wonderful time playing it. In his words, “it’s an easy game to learn and play”. While it is easy to teach, we found that we had to remind the Child Geeks a few times about the Army card trump rule. Sadly, there is nothing on the cards to suggest that one Army card will always beat another. While not detrimental to the game, it did cause some of the Child Geeks to lose out on some points. The Child Geeks enjoyed the game and asked for more. I actually found PLAGUE to be aa pretty interesting game. I am no stranger to trick-tacking games and I have played them to death (excuse the pun). My wife loves them and I have a hard time saying “no” to my wife when she asks me to play games with her. The problem is, she is terribly good at them and I end up spending 20 minutes achieving nothing more than a bruised ego. To date, I can count the number of times I have won a traditional card game against my wife on one hand using only 2 fingers. After 14 years, that’s a pretty cruddy record. PLAGUE doesn’t really do anything new, but the way points are collected makes the game more engaging. For those who are not at all attracted to trick-taking card games, PLAGUE will be of little interest. As my wife is a lover of Hearts, Spades, and various other card games that I have played way too often (and still no good at), I am most pleased to be able to provide a different type of trick-taking card game for us to play. I enjoy the challenge of balancing card power with card value, and the open table information makes it easy to see where I am in points in comparison to my opponents. 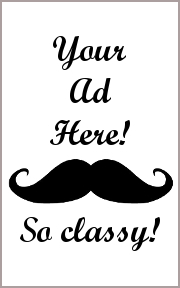 Visually, this gives me the right information I need to know when to take a risky move or sit back and play it safe. The real “trick” to this trick-taking card game is the hand management you have to carefully watch at all times. While other trick-tacking card games give you a set amount of points, PLAGUE requires the player to carefully consider what cards they want to play to win at risk of forfeiting a lot of points later. This proved to be exactly what I was looking for in a trick-taking card game as it gave me a good deal more to think about and play with. 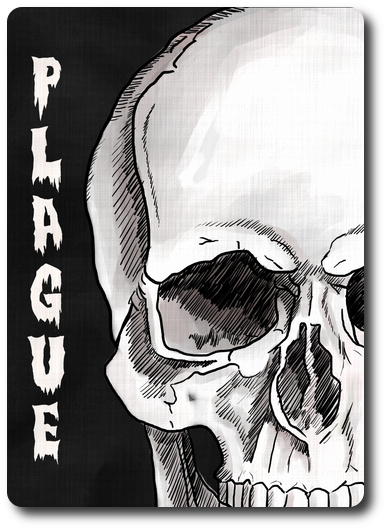 If you are a fan of trick-taking card games, do give PLAGUE a try! If Medieval shenanigans isn’t your bag, give Neptune a try. It has similar rules and is set in a science fiction themed wonderland of cold space, murderous asteroids, and space bandits that go “pew pew”. 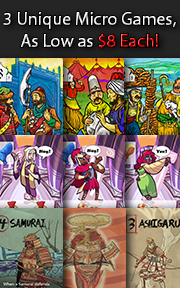 Tagged Card Games, Medieval Games, Parent Geek Approved. Bookmark the permalink.